While anyone can take pictures of art, the images tell far less of a story without expert analysis. For the past four decades our Chief Scientist has studied over 4,500 works of art from Old Masters around the globe. In so doing he has developed an unparalleled amount of experience and has amassed an extensive collection of reference studies, images, physical samples and data. Furthermore, he has refined the skills and methodology, and developed entirely new techniques, used to analyze the data generated from these studies in a repeatable and scientific way. 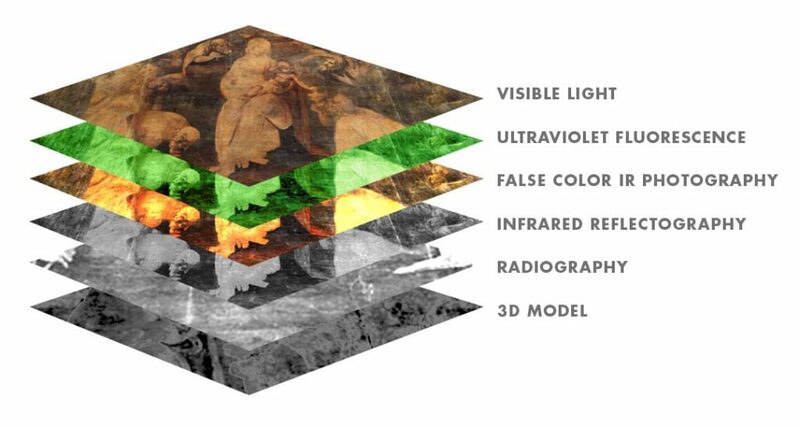 Image captures performed as part of the authentication process result in multi-spectral image stacks (the example below shows some of the wavelengths used) and detailed reports about an artworks’ history. While we are pushing the limits of science and technology to deliver the most reliable and evidence based art authentication, we are also developing new and innovative ways to bring the stories that these images tell to the public.